We’ve all been there. That cold sweat that sets in after you’ve checked your pockets, your bag, the car and down the back of the sofa and you still haven’t found your beloved smartphone. However, savvy Android users need fret no longer, as Android Device Manager is here to reunite you with your walkabout gadgetry. If your device is associated with your Google account, you can use the service to find the approximate location of your device, reset the password or even perform a complete factory reset. Best of all, it’s a complete doddle to set up. Find the Google Settings app on your smartphone (a green box with a G and some cogs in it) then hit the Android Device Manager option. Check both tick boxes then on your computer navigate to www.android.com/devicemanager and sign into your Google account. Tap Accept if it asks you to allow location data. Providing your device is on and within the range of mobile data or Wi-fi, you’ll then see the location of your device on Google Maps plus other useful info such as an approximate address and last-location date and time. You now have a few options. You can use the button on the left to ring your phone at full volume for five minutes, a really handy feature if you’re near it but can’t see it! You can also use the middle button to remotely lock your phone with a new password. The Erase button will perform a remote factory reset on your device. All of your apps, photos, music and settings will be deleted. It’s irreversible, but if your phone has been lost or stolen and you have no hope of recovering it, this is a useful means of protecting your personal details. Here is a simple Power Supply for your electronics project. lED1 to a value below 10ma (milli-ampere). The output from bridge rectifier is smoothed by 470μF capacitor C1. C2 is used for bypassing high frequency ripple. 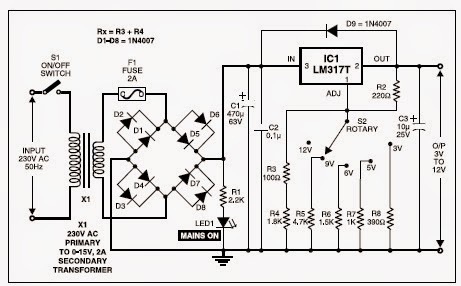 Schematic diagram of power supply.